.. is the title of a new exhibition at the Imperial War Museum charting the depiction of war on film and of film on our perception of war. I went to see it. It opens with ‘The Battle of the Somme‘ a largely documentary work of 1916 commissioned by the British government for showing in cinemas, which I found surprising. Given the large numbers of British men serving on the continent, many cinema-goers would have hoped to see a loved one, a husband, father or brother, a particularly poignant idea. Although some scenes are staged there is footage of real battles and their aftermath – sufficient to prompt complaint at the time. Our view of WWI has, the exhibition notes point out, been coloured by the films made about it. From ‘All Quiet on the Western Front‘, through ‘Days of Glory‘ to ‘Oh, What a Lovely War!‘ they contributed to the ‘lions led by donkeys’ idea and that of its general futility (not an attitude common during and immediately after the war). I was hard pressed to think of any ‘patriotic’ WWI films. Can you? WWII is featured heavily. There is an interesting comparison between British and German propaganda and newsreel. Without the sound the ‘Home Front’ propaganda shorts from both nations are pretty much interchangeable. 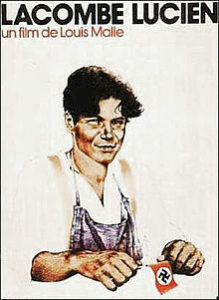 Not so the full length films – Cavalcanti’s ‘Went the Day Well?‘ as compared to Hippler’s ‘Der Ewige Jude‘ ( ‘The Eternal Jew‘ ). Other contemporaneous WWII films range from Chaplin’s ‘The Great Dictator‘, through the less than snappily titled ‘Victory with Air Power‘ from Walt Disney to ‘In Which We Serve‘ and Leni Riefensthal’s ‘The Triumph of the Will‘. 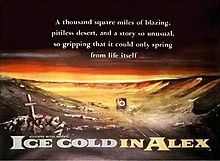 But it is post war, in the 1950s, when the British war film seemed to reach its popular zenith, with ‘Ice Cold in Alex’, ‘The Dambusters‘, ‘The Colditz Story‘ and others. I remember them being shown on Sunday afternoon TV in the 60s and 70s. These were also propaganda, reminding a ration-strapped population of what great things they had done and how they could go on doing them. How much of current British identity is bound up with these, and similar, films, especially for people over fifty? The exhibition covers later wars, most notably Vietnam and Iraq, coming right up to date with ‘Eye in the Sky‘ the Helen Mirren vehicle about drone warfare. The satires are there – ‘Dr Strangelove‘ and ‘Catch 22‘. It also features the never-changing search for verisimilitude – most movie makers strive mightily to get historical accuracy, though some simply change history to fit, like ‘Operation Burma‘ in which the Americans re-take south-east Asia on their own! It is on detail that the exhibition is strong. There are original scripts and correspondence, interviews with directors ( for the second time this Summer I was reading Stanley Kubrick‘s words, he gets a little section to himself ). 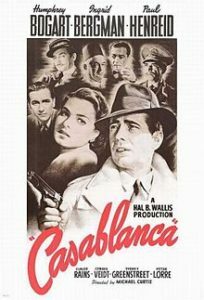 There is a lot of interesting background – many of the actors in the WWII films had taken part in the war, so Paul Heinreid, the Austrian actor who played resistance leader Victor Lazlo in ‘Casablanca‘ had, in real life, smuggled a Jewish friend out of Berlin. Marlene Dietrich, a film star in her native Germany before she went to Hollywood, persistently refused all the Third Reich’s blandishments to come home. Interestingly, on film music, Elmer Bernstein’s sons complained to UKIP about their father’s score for ‘The Great Escape‘ being used for political purposes at UKIP Brexit rallies in 2016. The focus is almost exclusively anglophone, but for a few German examples (including modern ones, like ‘Das Boot‘ ) and, even so, there is nothing from Antipodean cinema. One mention of Renoir’s ‘La Grande Illusion‘ is all we get from elsewhere in Europe. 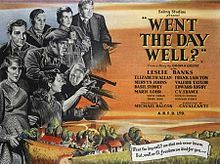 Where, on WWII, were Menzel’s ‘Closely Observed Trains‘, Wajda’s ‘Kanal’ or Malle’s ‘Lancombe, Lucien‘ ? And what about Pontecorvo’s ‘The Battle for Algiers’ or Rosellini’s ‘Roma, citta aperta? So it is somewhat limited. I guess there wasn’t enough room for all and the concentration is on British ( and US ) films. Nonetheless, within these limits, this is a good exhibition and worth a visit. 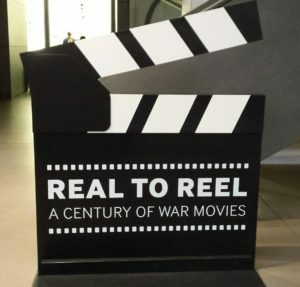 ‘Real to Reel’ runs at the Imperial War Museum until 8th January 2017, entry costs £10, £7 concessions. Lambeth North is the nearest tube, but please note that this station is closed until the middle of November 2016, so use buses – No.s 433 and 630 run from Vauxhall to Elephant and Castle. This entry was posted in Art, Culture Vulture, London and tagged History, London, Worth a visit by juliej. Bookmark the permalink.